Why do we camp, emphasis on DO as in why DO we camp? I thought I knew the answer but like so many things now I’m doubting what I do and don’t know. I think I’m in a funk, I’m “funking”, and while it’s not a terminal condition it is one that is nevertheless somewhat debilitating. I’m not really in a bad mood as such, it’s not that my knickers are too tight, it’s more that I just feel tired and somewhat out of sorts. Is it because I’ve f***ed with my meds? (that will be another post). I took this photo (purely by accident mind you) and then realized after the fact that the blur, the out of focus, was quite indicative of how I felt at that time. 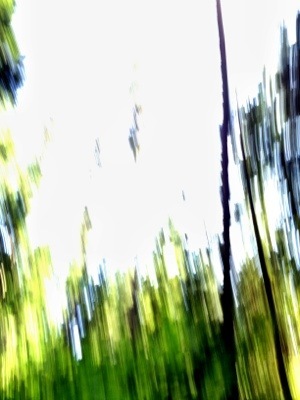 I was fuzzy, had no focus, and couldn’t tell the forest for the trees. We were camping in a site called Pioneer Park in Eastern Washington and it was the tail-end of our camping excursion. We had been on the road, or in our trailer at least (for the most part) for about 21 days, no, make that 25 days. At that point in time it felt like too long. I asked my wife “why do we camp?”, she said “to relax”. Why then don’t I feel relaxed? I think it was largely due to being on the road for so long. Some of that was stationed in one campground for an extended period, mush of it was more of a transient nature moving from one campground to another. Or, which was often the case, in a state of flux and having no designated camping home. On the road, driving, looking, weary and just wanting to settle down. I don’t know that I can answer the question here, not in so few words. I do agree with my wife though, I think we camp to relax. It’s some hold over from an earlier time in our evolution, a pull or yearning to get back to nature. Get back to our roots, to a simpler and less complicated time. Why then do we have solar cells, generators, queen size beds, microwaves, ice makers……..the list goes on. Do they help us relax?? So I ask you, why DO we camp. I’d love to hear your thoughts….please! Meds, Can’t live With ’em, Can’t Live without them.